Will a Home Warranty Cover My Roof Replacement? Arizona homeowners are prone to all kinds of roof damage thanks to the state’s harsh climate. The blazing summers can cause shingles to crack and degrade, leading to leaks that can cause extensive damage to the roof and the rest of the home. The yearly monsoons bring with them high winds and intense rainstorms, which can cause significant damage to your roof. Phoenix roof repair and roof replacement can both be costly. If you have a home warranty, some of those costs may be covered. But unfortunately, the answer to whether or not your home warranty will cover your roof replacement is usually no. You may have a home warranty that you purchased, or it may have been included with your new home purchase. Look at the details of that policy to find out what is covered. If you aren’t sure, just call the customer service line to find out if roof replacement is covered and under what circumstances. Basic home warranties generally do not cover roof replacement. You may have to add a specific policy for it, kind of like adding a flood policy to your homeowner’s insurance plan. If you notice that you have a leak or suspect that you are having other problems with your roof, contact your home warranty provider right away. Even a small leak or other seemingly minor issue can lead to major damage to your roof and your home. A small leak can let a steady trickle of water into your home that contributes to rot. Large portions of your home can be affected very quickly. Contact your home warranty provider to get help with your claim. You will need to call a roofing company for an inspection and an estimate for the repairs. Before you ever discover that you have a leak, you need to be taking action to protect your home. Even the home warranties that offer coverage for roof replacement or repairs typically have an addendum that denies coverage for any preexisting conditions. That means that if your roof was already aging out and experiencing problems before a tree fell through it, you may not get coverage. The best way to protect your home is to hire a roofing company to perform an annual inspection and to provide any maintenance or repairs that are needed. Getting routine maintenance will strengthen your roof and minimize the risk of future problems – the same way that getting regular oil changes on your car makes your car healthier and extends its lifespan. Unfortunately, there are many unscrupulous people out there claiming to be professionals who are ready to prey on desperate homeowners. They may give you an estimate, pocket your home warranty check, and then never do any repairs. Or they may inflate the cost of the repairs or even make up “necessary” repairs so as to get more money from your home warranty company. Some “storm chasers” even go around after storms offering to do inspections and then cause damage while they are up on the roof. Make sure you hire a reputable Phoenix roofer who has the appropriate license and insurance to do the work. You can easily learn about a roofer’s reputation by asking for client references, looking for reports with the Better Business Bureau, and researching the company online. If the roofer has a shady reputation, you will find plenty of negative reviews and posts from angry clients who want to tell everyone all about it. 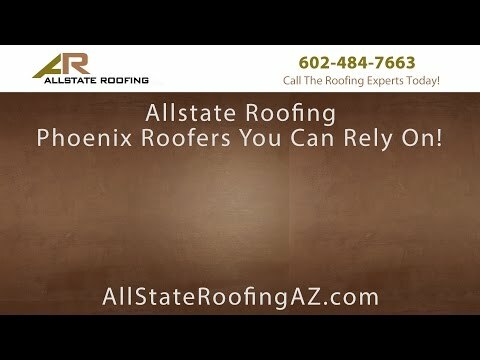 Allstate Roofing has a reputation as one of the most-trusted roofing companies in Arizona. We offer roof replacement for both residential and commercial structures, and we install all the popular types of roofing, including tile, shingle, and foam. Every roofer on our team is licensed and insured, and we are committed to providing high-quality, long-lasting results at an affordable price – whether you have home warranty coverage or are financing your new roof installation yourself. Call us in Arizona today to get a free estimate for your roof replacement.